Seem to have tasks that linger on and on from one week to the next week to the next week. Have a hard time focusing on your highest priority activities because you have lingering, small, really insignificant tasks that start adding up and eating away at your focus. Want a way to clean your slate and start fresh each week. Whether you desire more time with your family or more focused time to work on a particular project that’s going to move your business forward, a weekly rapid-fire power hour is a must. Consistently doing one gives you the ability to have extreme laser focus so you are fully present and most efficient when completing those tasks that seem particularly hard to knock off your list. A weekly power hour can clean the slate by clearing your desk, and possibly even your task list and inbox, so you can have more focused time for what matters most. The rapid fire power hour should be performed in addition to a weekly review which is another part of the productivity system I utilize. It enables me to start off each week feeling renewed and ready to tackle anything. In short, a weekly power hour is a block of time set aside at the end of each week to work on small and specific tasks that pile up over the week. It’s a period of time scheduled to intentionally work quickly on simple tasks that may otherwise fall into the cracks. In addition to your weekly review, include a rapid fire power hour to knock out as many small tasks on your to-do list as possible. Some may take only two minutes like a simple email, reviewing a document, or paying a bill. If you were to do those tasks sporadically throughout the week when they pop up, they would mess with the flow of your high priority tasks you are working on. They would also add up to be big time wasters because after work is interrupted for whatever reason, it takes an average of 23 minutes and 15 seconds to get back to the task. If you batch small tasks all together into one rapid fire power hour, however, you can address and complete all of those little tasks back-to-back with utmost efficiency. While taking care of necessary, menial tasks doesn’t directly grow your business, accomplishing them instead of ignoring them greatly improves your productivity and the state of your business. That is because of the sheer fact that if they did not get done in a timely manner, they would pop up sporadically as urgent, interfere with your focus, beg your attention away from your highest value activities, and potentially cause even greater problems. Don’t let low-value tasks run from week to week and lag over until they become pressing issues. If you put off making a doctor’s appointment, paying a bill, or responding to someone that emailed you for too long, you risk poor health, a late fee, and the loss of a potential client. Capture all of those low-value tasks throughout the week then get them done on Friday during your rapid fire power hour. Deciding whether or not a task should be completed during your power hour is an easy feat that should involve less than 2 minutes of your time. For every small, quick task that needs to be completed throughout the week, ask yourself, Can this wait until my power hour? If there would be no repercussions from waiting, the answer should be yes. 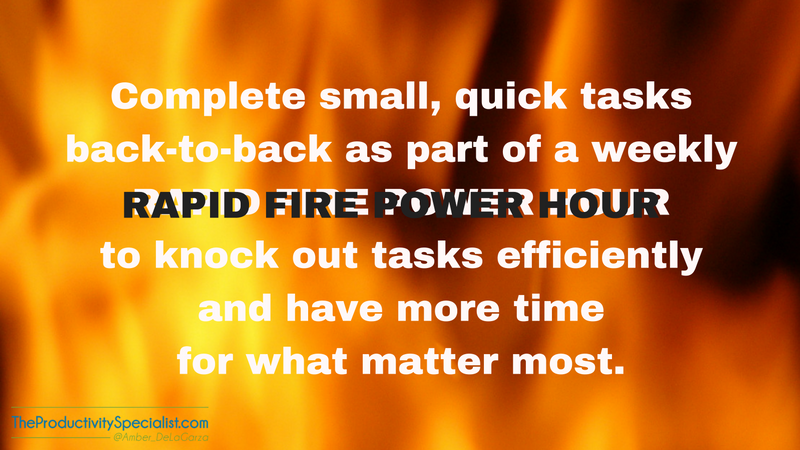 Capture the task on your task list to be completed during your Rapid Fire Power Hour. A great idea is to also have a folder in your email or box labeled Power Hour in which you can throw all paperwork that will be needed for it. Then you won’t have to rummage through all of your other paperwork to find those tasks and can tackle them with ease quickly. Organization is key. You are in for a little surprise once you complete your first rapid fire power hour. You are going to get a burst of energy which may prompt creativity and new ideas because you are removing the incessant, nagging voices thinking about all that needs to be done, thus clearing your head and making room for more productive thought. Once you have accomplished all of the insignificant but necessary tasks on your to-do list by the end of each week, you will be able to start each Monday renewed with a clean slate. You will be able to accomplish high-priority tasks with ease at incredible speeds and have more time to focus on what really matters most. Schedule time for a rapid-fire power hour each week, hold yourself to working through your task list intentionally during it, and you will be setting yourself up for success the following week. It’s just one hour. Make the time!